Free Reading Services for those unable to use standard print. Kansas Talking Books provides books and magazines on tape and in Braille for Kansas residents who are unable to read or use standard printed materials due to low vision or blindness, physical limitations, or physically based reading disabilities (such as dyslexia). A certifying authority or a Library supervisor must sign the application as explained on the form. 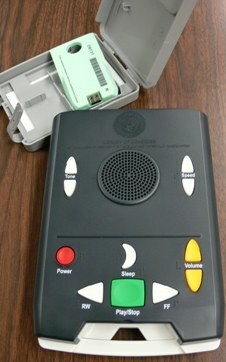 A Talking Books cassette player, which plays four-track cassettes, is provided. Recently, digital players have become available as well. Books are sent and returned, postage free, through regular U. S. mail. If the player stops working, it may be sent back in the original box free of charge; a replacement one will be sent. An application may be picked up at the Library or downloaded online. Search the Kansas Talking Book Library Catalog for a list of available titles. Area residents who cannot read 14-point type due to a physical, vision or cognitive problem can apply for a free receiver on loan to listen to volunteers read The Wichita Eagle and other national newspapers, magazines and novels as well as poetry readings, short stories and other presentations by local community volunteers. Local and national programming is provided 24 hours a day 7 days a week. Applications may be picked up at the Library or downloaded online. Wichita Radio Reading Service, 3317 E. 17th Street, Wichita, KS 67208.